Buckle your seat belts folks, this is going to be the rant of all my rants. This entire post was inspired by a late-night conversation with Alex @ California Pollution. Authors, Creators, Writers: Please, I'm begging... end the never-ending story. I have a confession to make. I had absolutely no intention of watching Fantastic Beasts and Where to Find Them. I had seven volumes of Harry Potter and that. was. enough. for. me. Prior to the Fantastic Beasts release, I saw Sorcerer's Stone in theaters again. In the previews, they played clips from an interview that J.K. Rowling did and I was convinced. She had put so much into this prequel story and so I agreed to give it a chance. Another confession. I flat-out refuse to read Cursed Child. My mind will never be changed on this. I've actually been really bothered seeing "spoilers" of what happens in the play because I don't want my Harry Potter characters tainted. I do not recognize Cursed Child as canon because Harry Potter ended with Deathly Hallows (there is no eighth Harry Potter book, people!) and that is that. I've allowed myself to be immersed in Fantastic Beasts 1) because it's a prequel not a sequel and 2) it didn't feature the same characters (for the most part), and when it did, it seemed that it would only touch on storylines that had already been hinted at in the canon. I think that prequels can still be risky, but I was confident in J.K.'s ability to create an enticing story. Fantastic Beasts explained more in-depth the histories that were hinted at in Harry Potter rather than creating irrelevant yet related story lines. I'd put it on-par with the Star Wars prequels - they both explain why things were the way that they were without tainting (too much) the characters that we already knew and loved. Cursed Child breaks these rules. "But J.K. Rowling didn't write it," you might argue. She wrote the original story that it was based off of, my friend, and that is close enough for me. Cursed Child is an alternate reality. I don't need to know about Voldemort's "love" life (like I'm going to believe that that could ever exist) or Harry's bad parenting. Harry Potter's story ended 19 years after the Battle of Hogwarts, in the Deathly Hallows epilogue. I'm not against us readers altering or creating our own related stories through fanfiction, but I feel that should be left to the fans, not the original authors. After an author's original publication, if there was any intent to write more later on (or prequels later), it should have been established somewhere that the end wasn't the end. In 2007, Rowling announced that Dumbledore was gay to a packed house in New York's Carnegie Hall as part of her US book tour. This is problematic because JKR didn't feel compelled to provide this representation in the books in any way, but accepted praise from the LGBTQ+ community after announcing it and expecting it to be accepted as canon. Given the opportunity to introduce the Dumbledore/Grindelwald storyline in Fantastic Beasts, J.K. still did not. In 2014, JKR confessed that pairing off Ron and Hermione had been a mistake. In retrospect, she thinks it would have made sense for Hermione to marry Harry instead. Not only does this change how we perceive the canon, but it contradicts prior interviews as well. The story ended, so please, just leave it be. I know that she spent many, many years planning the series before she even began writing it, so it's hard to argue that she hadn't always seen Dumbledore as gay, but with the Nagini cameo in the new Fantastic Beasts trailer and her tweeting that she's known this for ~20 years,~ I can't help but wonder, if she did know that Nagini had once been a woman, why she wrote about Voldemort surviving off of her "milk" in Goblet of Fire? 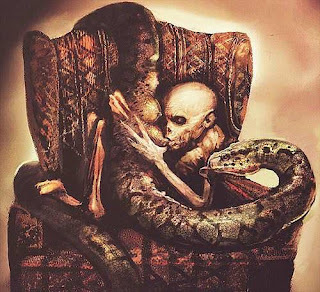 The illustration is an official concept art for Harry Potter and the Goblet of Fire. It isn't a fan art. It appears on "Harry Potter: Page to Screen" book. Each time JKR adds to the story, part of me gets transported back to my 11-year-old self, filled with overwhelming excitement learning about the characters that I have spent nearly my whole life knowing and loving. A larger part of me, however, is beyond annoyed. If her revelations were important to the books, they would have been in the books. If Hogwarts was welcoming of LGBTQ+, black Hermiones and the inter-racial relationships as a result, or Jewish wizards, we wouldn't need to take to twitter to learn it. Just because JKR failed to show representation of minorities in her series outside of minor characters does not allow her to use social media to save face. She is always writing new content for Pottermore. Fans make up theories - like the one that I heard yesterday about Luna also being a Maledictus - because we, too, cannot let our beloved series go. 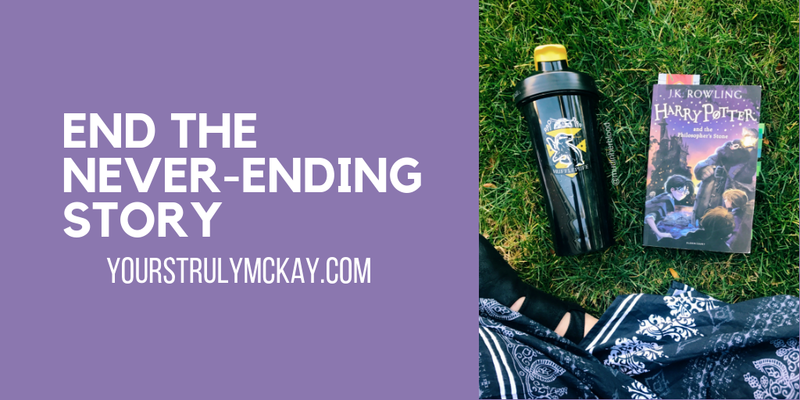 I know what you're thinking... "McKay, you've written about 30 Harry Potter blog posts in the last couple of months. Aren't you being just a bit hypocritical?" In my own defense, I feel like I write about more arbitrary things or I am just analyzing characters, rather than making something out of nothing. I am not a fan of overcomplicating storylines. Luna was weird because she was Luna. She doesn't need more of a back story to make her interesting or relevant. We loved her as she was, not as JKR could confirm her to be (so that she can still have control over a world that has ended). I don't want to hear more about Luna. Leave my girl alone. Leave Romione alone while you're at it, too. I don't think I can even begin to comprehend what it would be like to create such an international, successful story like Harry Potter or Star Wars. I'm sure it would be difficult to part with the worlds you created and the characters that you brought to life, especially with the modern pressure from interactions with fans on a daily basis. But from a fan to a creator, we don't need more. Your creations were enough for us as they were, and that's okay!